Auerbach comes from a family of German jews. In 1939, to allow the little one to escape nazi horror, his parents send him to England. Short after, his whole family dies in a concentration camp leaving Auerbach orphan. In Auerbach’s work, we see 3 women repeatedly. His wife, Julia Wostenholme (in his paintings is going to appear as J.M. ); his lover since he was 17, Estella Olive West (E.O.W); and his favorite model, Juliet Yardley Mills (J.Y.M.). Today we see the face of the latter. Auerbach’s character was strong. His lover, years after, would recall that the artist demanded her to sit for hours to paint her and, if he wasn’t satisfied with the result, started all over again from the beginning, trying that, in each session, his model would adopt exactly the same position as before, because he didn’t like to draw outlines for a portrait. Like this, is not surprise that he needed a ridiculous amount of time to finish each canvas. Technique he used for his paintings was odd too. Strictly, its name is impasto, which means to use the paint really dense, which allows the painting to have a great deal of texture. Many say that Auerbach’s paintings are not really paintings but sculptures. Auerbach took this technique to the extreme: during an exhibition in the Beaux Arts of London, several of his paintings had to be shown flat instead of being hung to the wall, as the organizers were afraid that the thick oil painting would fall off. Because of a matter of budget, in the beginning of Auerbach’s work we see a lot of earthly colors, as they are cheaper than the brighter ones. But after he received a grant, he is going to use these bright ones, achieving a more colorful work, although no less dark. In Head of J.Y.M. No. 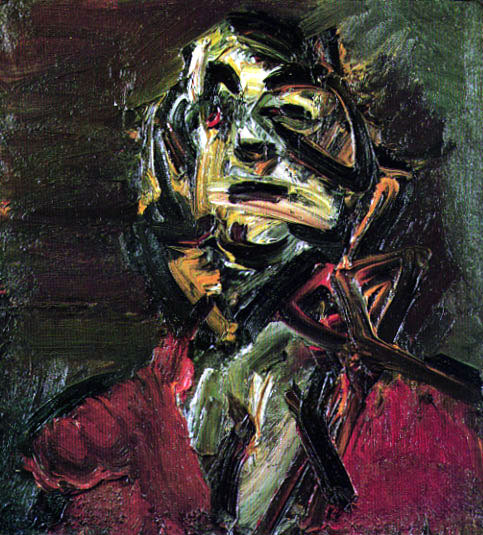 1, we can see the interpretation Auerbach makes of the face of his model. We see the colors he uses in his later work, and we can also see the amount of paint he uses. Definitely, Auerbach belongs to the expressionist movement, not following the movements which were in fashion at that time, such as the conceptual and abstract art. In the painting, we see Auerbach emotion put violently on the canvas: the strong and decided strokes give us the sensation of a frantic, raging madness. The colors of the face are strange and he uses white, green and orange, mixing them without any academic interest for shadows or perspective. That’s why, the bidimensionality of the content contrasts with the tridimensionality of the texture. ~ by Álvaro Mazzino on September 2, 2010. SHARE MY WORK, for consideration. China is oftentimes thought of as an emerging market but the reality is that the vast majority of phones sold in China today are smartphones, similar to other mature markets like the U.S., U.K., Australia, and Japan. This entry was posted on September 2, 2010 at 09:28 and is filed under Expresionism.You can follow any responses to this entry through the RSS 2.0 feed.You can leave a response, or trackback from your own site.